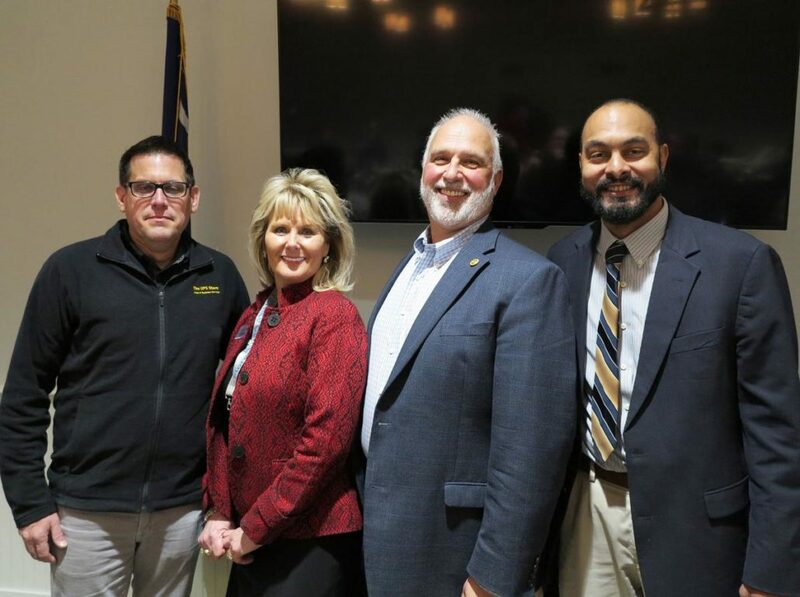 FLORENCE, S.C. – Two colleagues from the Florence Center were neck and neck for the Greater Florence Chamber of Commerce Ambassador of the Year 2018 award, based on a point system. The award recipient was announced Wednesday at the annual Ambassador Luncheon, held at the chamber of commerce office in downtown Florence. Brian Davison, director of sales, bested Patricia Taira, senior sales manager, by only 20 points to win top honors. Third place was awarded to David Fountain, who owns two UPS stores in Florence. The award is based on points earned for participating in various chamber activities such as attending ribbon cuttings, Business After Hours and the Ambassador Luncheon, hosting an event or volunteering for a chamber event with the most points, a total of 30, earned for bringing a new paying member to the chamber. Seventy-seven new members joined the Greater Florence Chamber of Commerce in 2018, said Jay Lavrinc, director of membership relations with the Greater Florence Chamber of Commerce. The top three ambassadors had a combined 2,013 points or 33 percent of the total points for the top 20 ambassadors. Davison earned 1,200 points for the year, Taira, 1,180 and Fountain 695. Fifteen new ambassadors joined the chamber team in 2018, said Lavrinc. Fountain was one of them. Davison and Taira joined during 2017. Davison said he joined because it was an opportunity for the Florence Center to be seen and represented to the public, to be a brand for the center. Lavrinc said there was a “friendly competition” among the top contenders. He said the competition was all in fun. Davison said he didn’t record his points his first year as an ambassador because he didn’t believe in points. He said Lavrinc convinced him to keep track this past year, and it paid off. The Ambassador of the Year receives a plaque and a $100 gift certificate. Lavrinc told the ambassadors that the new year has already begun with a ribbon cutting on Tuesday and that it is time to hit the ground running. “We have a good group of ambassadors, and we appreciate all that you do,” said Mike Miller, president of the chamber. He said a lot is happening right now in Florence that is yet to be announced. He said Hyatt Place hotel and Carolina Bank, both downtown, should be having ribbon cuttings by mid-February.